The Swiss conductor Matthias Bamert studied music in Darmstadt and Paris with Pierre Boulez and Stockhausen. He was principal oboist with the Salzburg Mozart Orchestra between 1965 to 1969, then switched to conducting. 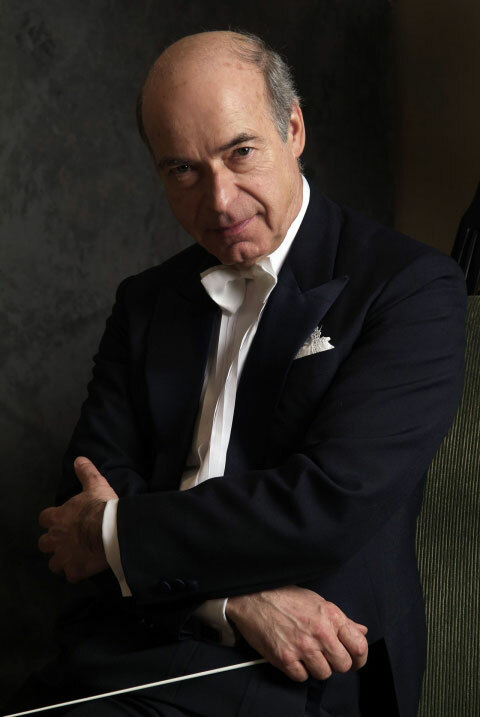 Matthias Bamert's distinguished career began in North America as an apprentice to George Szell, later as Assistant Conductor to Leopold Stokowski and Resident Conductor of the Cleveland Orchestra under Lorin Maazel. He was Music Director of the Swiss Radio Orchestra (1977-1983), then began making a wider reputation across Europe. From 1985 to 1990, he was Principal Guest Conductor of the Scottish National Orchestra and Director of the Glasgow contemporary music festival Musica Nova, and premiered many works by Takemitsu, Casken, Macmillan and Rihm. He became famous for his creative programming as Director of the Lucerne Festival (1992-1998). Music Director of the London Mozart Players for seven years (1993-2000), Matthias Bamert masterminded a hugely successful series of recordings of works by "Contemporaries of Mozart". As part of their 50th Anniversary celebrations in 1999, he conducted the LMP at the BBC Proms and the Lucerne Festival. Matthias Bamert has also served as Principal Guest Conductor of New Zealand Symphony Orchestra (2000-2005), Associate Guest Conductor of Royal Philharmonic Orchestra (2003-2008), Principal Conductor of West Australian Symphony (2003-2007) and Malaysian Philharmonic Orchestra (2005-2008). In 2017, he has been appointed Principal Guest Conductor of the Daejeon Philharmonic Orchestra. From April 2018 he holds a position of Chief Conductor of Sapporo Symphony Orchestra. Matthias Bamert has appeared with many of the great orchestras of the world, including the Cleveland Orchestra, Chicago Symphony Orchestra, Orchestre de Paris, Philharmonia Orchestra, St. Petersburg Philharmonic Orchestra, Vienna Symphony Orchestra, Berliner Symphoniker, Los Angeles Philharmonic, Salzburg Mozarteum Orchestra, BBC Symphony Orchestra, MDR Sinfonieorchester, Pittsburgh Symphony Orchestra, Sydney Symphony Orchestra, etc. In Japan, he has conducted NHK Symphony Orchestra, Sapporo Symphony Orchestra, Kyoto Symphony Orchestra, Orchestra Ensemble Kanazawa, and Gunma Symphony Orchestra. A prolific recording artist, Matthias Bamert has made over 80 CDs, many of which have won international prizes. His output includes 24 CDs of music by Mozart's contemporaries with the London Mozart Players, the complete symphonies of Parry and five CDs of works by Frank Martin with the London Philharmonic Orchestra, the symphonies of Roberto Gerhard with the BBC Symphony Orchestra, the Dutch repertoire with the Residentie Orchestra and the Stokowski transcriptions as well as works by Korngold and Dohnanyi with the BBC Philharmonic Orchestra.